Good Friday everyone! 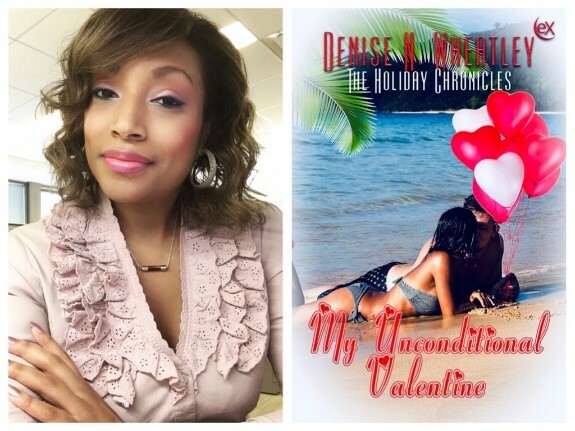 Today's entry features my friend and fellow eXtasy Books author, Denise Wheatley, and the second installment of "The Holiday Chronicles" is now live on eXtasy Book's website. "My Unconditional Valentine" is a continuation of Sasha and Drake's journey. They met and their romance began blossoming in "A Naughty Jolly Christmas". In this interview, Denise talks about various items related to "The Holiday Chronicles", and a few fun facts about her writing process. Thanks for joining me again, Denise! It's always a pleasure having you do a guest spot on my blog. Entertainment industry “it” couple Sasha Williams and Drake Lancaster are still going strong. Her impeccable publicist skills have kept him on the A-list, helping Drake land the lead role in a major Valentine’s Day movie. When filming wraps, the couple plan on heading to Cabo San Lucas, inviting both their families along to meet for the first time. 1) Your newest release with eXtasy Books, “My Unconditional Valentine” is a continuation of “A Naughty Jolly Christmas”. What made you decide to turn Sasha and Drake’s story into a series? That’s a great question, and the answer is very interesting. I honestly hadn’t thought about creating a series based on “A Naughty Jolly Christmas” until I realized eXtasy Books had added that little fact to my contract! So I thought about it and figured it’d be fun to carry the characters’ journey into various holiday-themed novellas. That’s how “The Holiday Chronicles” series came about. 2) Was the love triangle in “My Unconditional Valentine” with Mitch planned, or did it come to you as you were writing the actual story? Adding Mitch’s character to “My Unconditional Valentine” was definitely planned prior to writing the story. During the outlining process, I pondered where Sasha and Drake’s relationship should pick up at this point. In the beginning of the second installment, they’re both doing very well in their careers and things are going great in their relationship. But as readers will find out, all that changes, leaving their situation vulnerable enough for a third party to creep in and create turmoil between them. 3) What was your Kryptonite with this particular segment of Sasha and Drake’s journey? It would have to be writing about the struggles in their relationship. I’m one of those writers who believes that my characters are real people lol. So seeing them deal with negative issues strong enough to possibly tear them apart was sometimes difficult to write. And as much as I like Mitch’s character, I couldn’t help but root for Sasha and Drake. 4) What was the easiest part of writing this novella? The easiest part was connecting my real-life love of Hollywood to various aspects of the story. I really enjoy writing about movie stars, film production, tabloids and blogs, etc. So penning things like Drake confronting a director on set, the bad press he receives, and Sasha’s efforts to clean up his image as his publicist was a lot of fun for me. 5) There are two more installments of The Holiday Chronicles series. Will we be seeing more of Drake and Sasha’s journey via those books? 6) Does Drake ever get his Oscar? I so want Drake to get his Oscar! I won’t give anything away as far as what’s already happened and what I have planned. Let’s just say Drake is working hard to be taken seriously as an actor and land award-worthy roles. 7) How did publishing your first book change your process of writing? 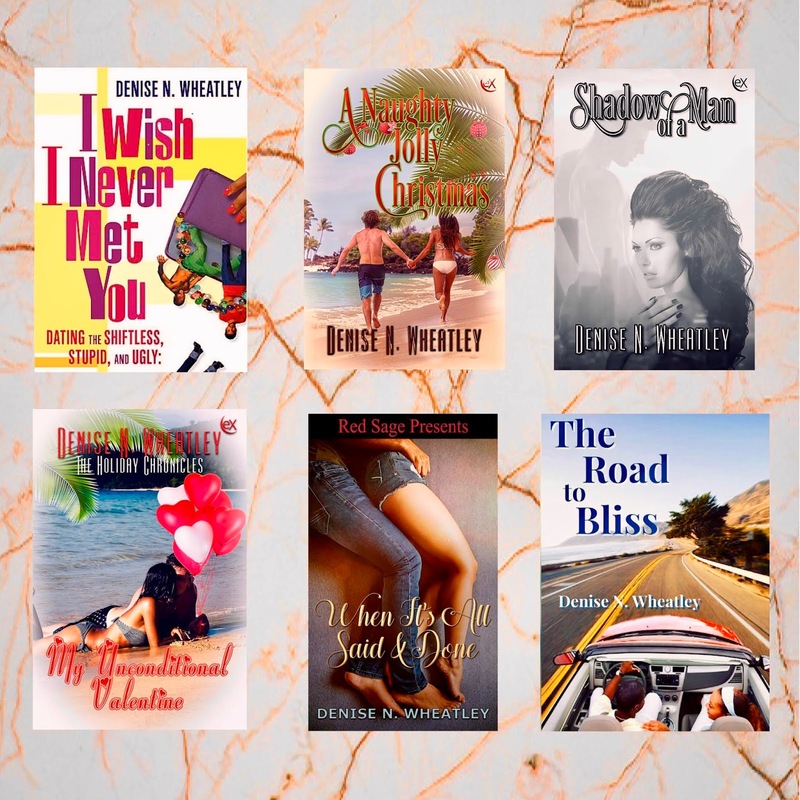 After publishing my first book (“I Wish I Never Met You,” which was released by Simon & Schuster), I realized that I had to continue writing from the heart. That first book is what I’d call chick lit with a mix of comedy and drama. For my second project, I wanted to do a romance that was more drama than comedy. I decided not to worry about what sold for me that first time out and to just write what I felt. I also began outlining my books more extensively in the beginning stages of my writing process, which really helps keep me focused and on track. 8) What kind of research do you do, and how long do you spend researching before beginning a book? I usually start writing my books then perform research as I go. I actually love doing research and depend heavily on the internet for information. I oftentimes begin with Google searches then go from there. I also have plenty of reference books that I turn to. I try to be as accurate as possible in my work, so I’ll spend however much time it takes to gather information during my writing process. 9) How do you select the names of your characters? My characters’ names usually just pop into my head when I’m brainstorming or writing the synopsis. If I’m stuck on finding a name for a certain character, I’ll research baby name websites and try my best to find something fitting based on the character’s personality traits. 10) Have you ever published anything as an Independent (Indie) author? If so, please tell us about your experience. 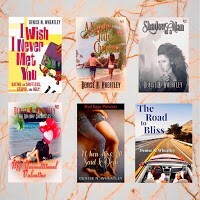 I have published books independently, and for starters, it’s a lot of work! You’re responsible for so much, such as editing, designing the cover, formatting the book properly, uploading it onto the various websites for purchasing and taking it to print (if you’re going that route). You’re managing all of your own promotion as well. So while you do have complete control over every aspect of your project, you’re also performing all the labor. At this point in my career, I definitely prefer traditional over indie publishing. Thank you so much for having me once again, VJ! It is always such a pleasure guest hosting on your blog. Looking forward to next time!